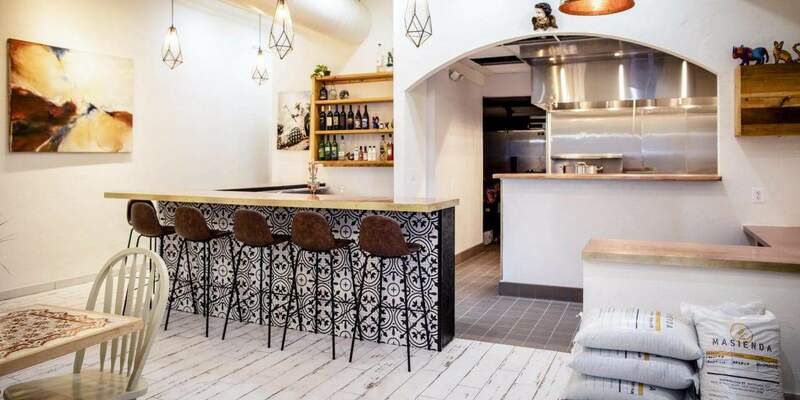 Cielo Rojo, a “fine-casual” restaurant specializing in Mexican cuisine, has opened at 7056 Carroll Ave.
Carolina McCandless, a Takoma Park native (her parents own Amano), is director of operations while her husband, David Perez, is the chef. The two met in 2012 at Gracias Madre, an organic vegan Mexican restaurant in San Francisco. The menu at Cielo Rojo, which is still under development according to its website, focuses on traditional Mexican cuisine such as tacos, enchiladas, pozole, gorditas, carnitas, salsas, and moles made in-house, with tortillas hand-made on the site using heirloom corn from Oaxaca, Mexico. When the couple announced their plans in January, 2018, McCandless explained the roots of the restaurant’s name (which means “red sky”). “It reminds us of the sunset,” she said. “One of the things that we loved doing when we lived in the Bay area was going to Fort Funstun, which was this beach that was 10 minutes from our house, and watching the sunset. “We just felt like [the name] connected us to where we come from and where we’re coming to now,” McCandless said, noting that it’s also the title of a 1950s Mexican song the couple likes. The restaurant is currently open for dinner from 5-10 p.m., with plans to offer lunch and brunch on the weekends. Outdoor seating will be available in the spring.